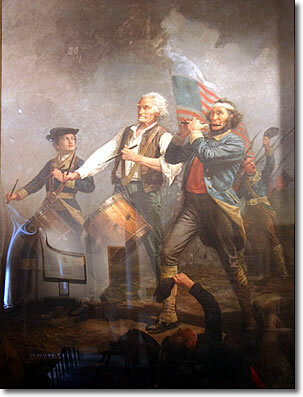 The famous patriotic painting which captured the glory of the American Revolution on its centenary anniversary now hangs in Marblehead's town hall. 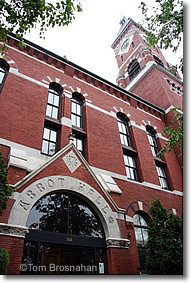 Abbot Hall, Marblehead's town hall on Washington Street, dominates the settlement from a hilltop, readily visible from most places in the town—you can hardly miss its red-brick clock tower, which underwent extensive restoration in 2014. Open weekdays and Saturday during business hours, it's open to visitors for free. A volunteer guide is often on hand to explain the features of the historic building and the artifacts and art works it holds. In the entry hall, for example, are murals painted as a Works Progress Administration (WPA) project outlining Marblehead's history as a great fishing and yachting port., and one of the birthplaces of the US Navy. and US Air Force. The Selectmen's Meeting Room (town council), to the left as you enter Abbot Hall, holds Archibald M Willard's marvelous patriotic painting, The Spirit of '76. The dramatic painting fills most of the far wall of the room. It's now protected behind glass, a necessary security measure. Painted by Willard in about 1875, it was first exhibited at the Centennial Exposition in Philadelphia in 1876, the 100th anniversary of the Declaration of Independence, which was signed and promulgated in Philadelphia (1776). After the Exposition, it was taken on tour to several American cities, including as far as San Francisco, California. After the tour it was bought by General John H Devereux, a native of Marblehead and self-made railroad magnate, who donated it to the town. It was hung in Abbot Hall in 1880. Archibald Willard's father was the model for the central figure in the painting, the whitel-haired drummer. General Devereux's son was the model for the boy drummer, and Hugh Mosher, a farmer and veteran of the Civil War, was the model for the fife player. The Selectmen's Meeting Room is a fine small town historical museum, with a gallery of patriotic paintings, historical manuscripts, documents and artifacts on display. Among the paintings is a copy of Emanuel Gottlieb Leutze's Washington Crossing the Delaware, an appropriate artifact as it was a regiment of Marblehead soldier-mariners who rowed the general across the treacherous winter waters of the Delaware to fight the victorious Battle of Trenton on Christmas day, 1776. To the left as you face The Spirit of '76, take a look at the deed (1684) by which the heirs of Great Sachem Nanepashemet of the Naumkeag Tribe of the Algonquin Nation transferred ownership of the 3700 acres (1500 hectares) of land of Marblehead to the British settlers from nearby Salem. in Abbot Hall, Marblehead MA.